I tried everything to find a job teaching English in Oaxaca. I went round all the language schools, gave out my number to random strangers, left signs up in internet cafes, libraries, universities, and even bars with my contact details. It was useless though, it seemed learning English wasn't important enough for Oaxacans. So I tried something else to pay my way, just to experience living abroad. 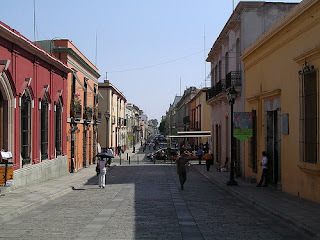 Here's the next short story about my time in Mexico. Working at a bus station? 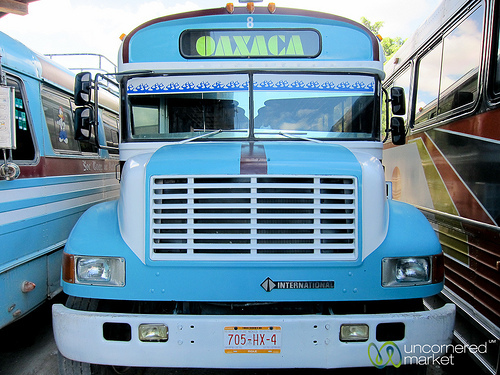 Finding a job teaching English in Oaxaca was proving to be impossible. “Any luck?” Victor asked with his usual grin. Victor worked in the hostel as a receptionist and had been trying to help me find potential English students. “Not yet, I’m starting to give up hope,” I said, wondering if I was ever going to teach. “Yeah of course; that would be great.” He could be my first student. “What did you want to practise, grammar, pronunciation, or expressions maybe?” He frowned. “Actually, we are short on travellers, I need someone go to the bus station and give out flyers.” He pulled out a wad of white and red leaflets from behind the counter. “If you find me three new clients a day, then you can sleep here for free.” I’d never considered working for a hostel. At least maybe I could get the chance to practise Spanish with the locals. A bus normally came every hour, down from Mexico City or up from the Coast, so there were plenty of potential bed fillers. I almost gave up after my first day though. “Hi, have you got anywhere to stay tonight?” I asked a German couple. “Sorry?” said the man as he brushed past. His girlfriend looked petrified. “No thanks.” They darted off. I hung about for three hours, trying to convince random travellers to stay at the hostel, but no one took me seriously. On the second day I persuade a group of five French travellers to stay at the hostel. “Yeah, good, good, you continue and you manager one day,” Victor said, content with his new business partner. With my Spanish phrasebook for company, I enjoyed working at the bus station. I saw persuading travellers as a kind of game. When a bus pulled in, I observed new arrivals through the windows until they came down the steps. Then I’d pounce. Most travellers gazed in surprise. “Don’t worry I’m staying there too, it’s a good location, clean and there’s hot water,” I’d say, which normally sold them. Not a bad place to walk on the way to work. I’d stopped being a traveller and was living abroad. Instead of being the naive newcomer; unsure where I was going, I’d become a guide giving people advice about where to go and what to do. Like any job, the same faces hung about each day. Javier and Paco were two mischievous entrepreneurial kids who polished shoes and sold sweets, lollypops, and cigarettes from their small portable shops. They tried to buff up my sandals everyday but instead I bought a Chupa Chup lollypop, which was normally older and bitterer than the frustrated taxi drivers who stood arguing over customers. I made a pact with the misery guts that I’d send over new travellers as long as I could speak with them first. I’m not sure they understood, but they were always pleased of a helping hand. After a few days, I was one of the bus station crew. One day I stayed in the centre because the hostel was full, and the day after Javier, Paco, and the taxi drivers had missed me. Chatting with the locals and Victor improved my Spanish, there was still a long way to go, but I was learning. I met most of the travellers coming into Oaxaca which helped with some excellent nights in the local night club, Temptation. I never gave up hope of finding students though. I’d strike up conversations with locals and tell them I was an English teacher. Some seemed keen to learn and I’d give them a card with my email on, but no one ever got in touch; Oaxacans were busy enjoying their relaxed, easy-going way of life. Victor was happy that I helped keep the hostel running. I stayed there for a couple of weeks living the simple life, practising my Spanish, going to the gym, and exploring parts of Oaxaca. I was glad to be away from the rat race in England and experiencing a different way of life. I’d often dreamed of living in a foreign country. The amount I earned was nothing compared to in England, but I was living abroad.